On 5 May 1956, sixty years ago today, Manchester City won the third FA Cup Final in the club's history by defeating Birmingham City 3-1 at Wembley Stadium. This particular final is remembered most for the exploits of City goalkeeper Bert Trautmann, a German former POW who had opted to remain in England after the war. 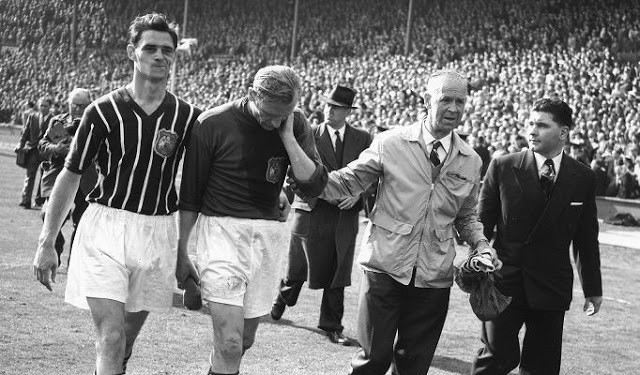 Heading into the final, Trautmann had recently been named Footballer of the Year by the Football Writers' Association, a rare feat for a goalkeeper, but Birmingham were very much the favourites after steamrolling their way to Wembley. After thrashing Torquay 7-1 in the 3rd round proper, Birmingham then smashed Leyton Orient 4-0, West Bromwich Albion 1-0 and Arsenal 3-1, before easily seeing off Sunderland 3-0 at Hillsborough in the Semi-Final. The Blues had played every match in their cup run away from home and had scored an impressive 18 goals, while only conceding twice. Although Manchester City had only edged their way to the final with a succession of one goal victories, they had gotten past Liverpool, Everton and Tottenham on their way to Wembley and were returning to the final after a narrow loss to Newcastle the previous year. The 100,000 strong crowd in North London for the final saw Manchester City attack Birmingham straight from the kickoff and were quickly rewarded with a goal through Joe Hayes in the third minute. Deploying forward Don Revie in a withdrawn role that mimicked the tactics of the great Hungarian side that had destroyed England three years before, Man City threatened to further expose the confused Birmingham defense and put the match out of reach in the early going. Unbowed, the Midlands club dug in and leveled through Noel Kinsey in the 15th minute. Despite chances for either side, the score would stay locked at 1-1 until the hour mark. As the match edged into the final half hour, some disastrous defending by Birmingham in the 62nd and 64th minute saw Manchester City score through Bobby Johnstone and Jack Dyson. With Birmingham scrambling to get back into the match, in the 73rd minute a desperate lunge by forward Peter Murphy in the penalty area saw his knee ram straight into Trautmann's neck. The big German was temporarily knocked unconscious and after being revived by the trainer he was in quite serious pain. Despite the keeper being unsteady on his feet and clearly dazed, the match was still very much in the days before substitutions so he had no choice but to either leave his side a man short or continue on. In the final nervy seventeen minutes, Trautmann's defenders did their best to keep Birmingham at bay, but he still had to make a few key saves to maintain his side's lead. 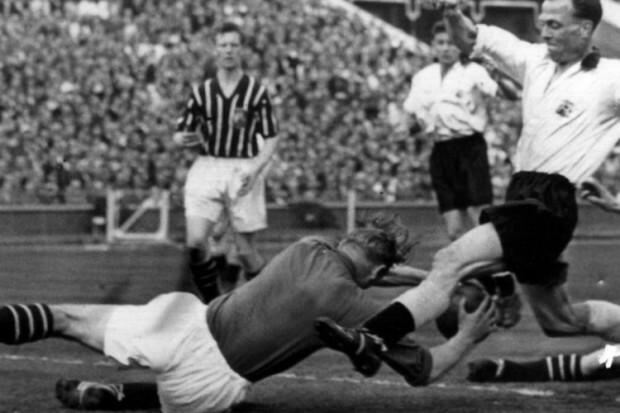 Even with a late aerial collision leaving him prone on the turf for several minutes in agony, Trautmann hung on to see his side through to victory. After trundling up old Wembley's 39 famous steps to the Royal Box to collect his winner's medal, a concerned Prince Phillip told Trautmann that his neck looked crooked. Three days later, an x-Ray revealed it turned out that he had dislodged five vertebrae, one of which was broken in two. It would take almost a year for him to recover, but the brave keeper would play on for City until 1964 and firmly establish himself as a club legend.